I’ll be speaking during the Pech Chang session at TOC Frankfurt in October. I’m going first and frankly, I’m terrified. Even so I’m looking forward to it. It feels like an opportunity to talk about some of the forces shaping the future of publishing and books. I mention it because one of the things I will be talking about is Branding and why, in a nichified world, it will become increasingly important. This has been an absolutely huge meme online in the last few days and it’s worth sharing some of those thoughts here. In the next 20 years or so, the brands that will dominate for a very long time will be created. Because the organization and delivery of stuff — including information — is being realigned into verticals; that is: subjects. The requirements of physical delivery required aggregation across interests that the Internet does not. So enduring horizontal brands of content like newspapers or book publishers but also outside content, among retailers, for example, that thrived across interest groups will find themselves challenged by new brands that are narrower and deeper. Being narrower and deeper permits a much more involved engagement with the audience. It strengthens the brand. Read the rest of the article, it makes complete sense, echoes much of what I think and places the conversation in context from a publishers perspective. And Eugene G. Schwartz’s blog about the talk over at Personanondata make me think that the ony issue is that some people haven’t seen the truth, that the digitisation of reading, makes publishers largely irrelevant unless they react adapt and change. Patrick over at the Vroman’s blog has a wonderful post that nicely sums up some of the arguments of Stein, alludes to some of and suggests some positive views too. The subsequent discussion is worth reading as well. 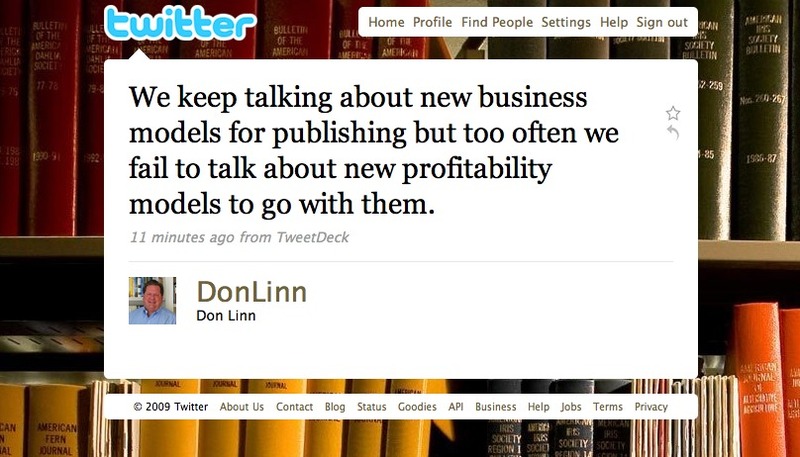 What this all comes down to of course is that as Don Linn noted in the tweet below, business models are all very well, but profitable business models are hard to find. Bob Miller, in this video from Ron Hogan, says pretty much what Don and Seth are saying but from the finance side of the fence. Changing a brand and making it matter will not be THE panacea, publishers will still shrink and they may well not survive as large companies. If they do, they will publish books (as Richard Eoin Nash has said and wouldn’t you know it, I cannot find the link, but here is a general one for Richard) like movies are currently produced. That is because the internet and digital media enables the removal of every single point in the value chain except author and consumer. In this model the only scale that needs large capital (and furthermore justifies the application of capital with large rewards) is when you need to market to everyone, brand will enable you to connect with niche reader and writers at as granular a level as you can building something that is worthwhile to readers, so worthwhile that they give you money. Of course, who YOU are may not be a publisher. Working on letters and notes, thoughts and ideas, trying to avoid too many down thoughts!